The Marvel Tsum Tsum Mobile Game has two main modes of game: Puzzle which is very similar to the original Disney Tsum Tsum Mobile Game and Battle Mode. 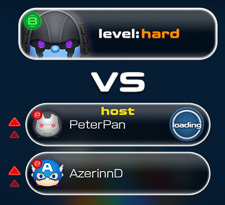 We will discuss Battle mode here while you can see information about Puzzle Mode by clicking here! In Battle mode you will be fighting against an opponent. 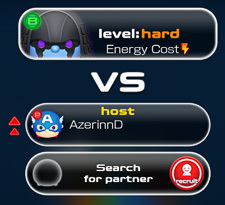 The opponents can be both Marvel Heroes and Villains. Normally every 5th Mission on a stage will be a battle mission. The extra missions for a stage can also be Battle missions. In addition to the mission battles there is also a battle option instead of playing the Stage missions. 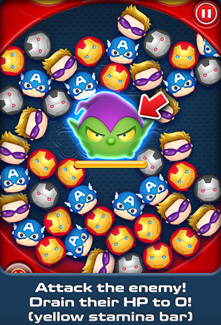 You attack your opponent by clearing Tsums as you would in the regular mode. Exploding bombs near you enemy will also damage them as will many character powers. Obviously the battle isn't one sided and your enemy will attack you back. These attacks can vary greatly and different opponents have different attacks. 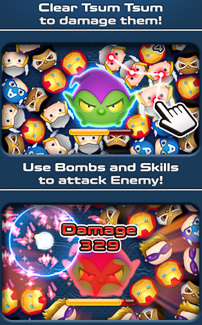 While there are the main attacks that reduce your hit points, they also have attacks that do things like make some Tsums on the screen unchainable for a period of time or will reduce your power charge level. Whenever you clear a chain of 7 or more Tsums (or a character's power clears 7 or more Tsums) a bomb will appear. You click it to pop the bomb and it will clear all the Tsums that surround it. In addition, there are several types of bombs and they have different additional benefits. Some character's powers and abilities can also create bombs. During the game there is a special "Rush" mode which is similar to "Mega Charge". When you are in Rush you will do extra damage to your opponent and they will be unable to attack you! 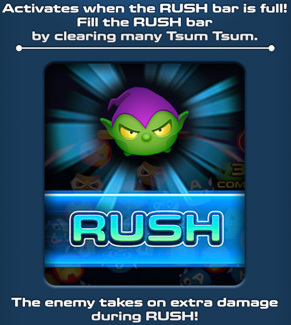 You enter Rush after you have cleared a certain number of Tsums and lasts 10 seconds (You can see the gauge at the bottom of the screen to see how close you are to entering Rush or how long is left if you are already in Rush). 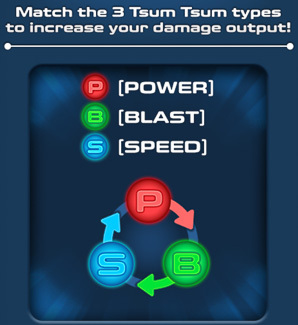 Each character is one of 3 types: Blast, Power, or Speed. Each type is strong against one of the other types and weak against the other (sorta like Rock, Paper, Scissors). You can use this to your advantage when you select your team. If you Leader's type is strong against your enemy's type then you will do extra damage and they will do less damage to you! If you click on the red "battle" button at the bottom of all non-game screens it will bring you to the battle menu. 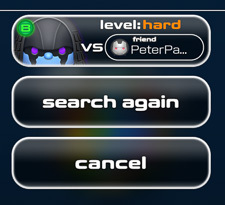 From here you can select opponents to battle. They are divided into two types: Heroes and Villains! Villains are normally available for a limited amount of time (and sometimes only for limited hours during the day). The currently available Villains will change over time. When you fight against a Villain there are two main things you can get that you can't get otherwise. First, you can get Violet ISO-8 which is required for the higher levels of character power. Second, you can also get a box that contains that Villain as a playable character! We keep track of the current battle schedule on our Battle Mode Schedule Page here! One of the great new features in the game is the ability to team up with friends or people close by to fight enemies together! When you team up with a friend your hit points will be shared and will be the combined total of both your team's hit points. 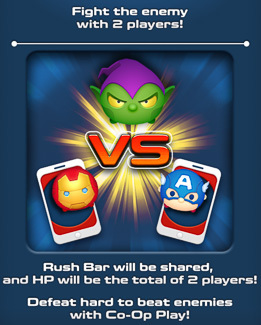 Also, the rush gauge will be shared between both people so both of you clearing Tsums helps to get into rush quicker! 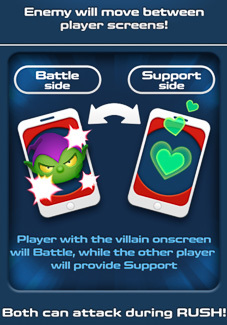 While there are two of you, there is still only one enemy which means they will sometimes be on your game board and sometimes on your friend's. 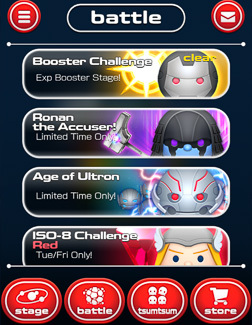 When they are on your game board you will clear Tsums to damage the enemy as usual. When the enemy is on your friend's screen you play a support role and clear Tsums will heal you! Your enemy will switch back and forth frequently so be ready to play both roles! Also, when you create a bomb you have a choice: You can either pop it like normal (and either damage your enemy or heal yourself depending on your current role) OR you can flick it to your friend's screen so they can use it! When you are in Rush mode both of you will do damage to your enemy! To start a Co-Op battle one of you will have to serve as the "host". 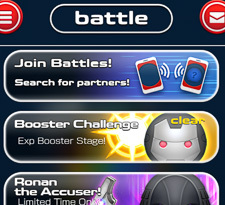 After that you will both have the battle start screen with both of you listed. At this point you both just need to press Start to start the battle! Discuss the Marvel Tsum Tsum Game Battle mode!